Last weekend we were in Klosters for the Skiing with Heroes Business Challenge, a key fundraiser for charity Supporting Wounded Veterans. This is the third Business Challenge that we have organised and this year there were 19 business teams taking part and competing against a further 6 teams of wounded veterans, one of which had flown in all the way from Canada. For months we had been praying for good snow conditions and perfect weather and after many anxious moments pouring over weather forecasts we were duly rewarded with perfection. Indeed, Klosters has rarely looked better and the pistes were immaculate. The Business Challengers arrived on Thursday after lunch, although a fair few had managed to get a late flight out on the Wednesday evening to get a day on the slopes before hostilities commenced. The veterans arrived later and just in time for the welcome drinks kindly sponsored by Klosters Tourismus. That was hotly followed by dinner at the iconic Chesa Grischuna, a perfect place at which to get festivities underway. 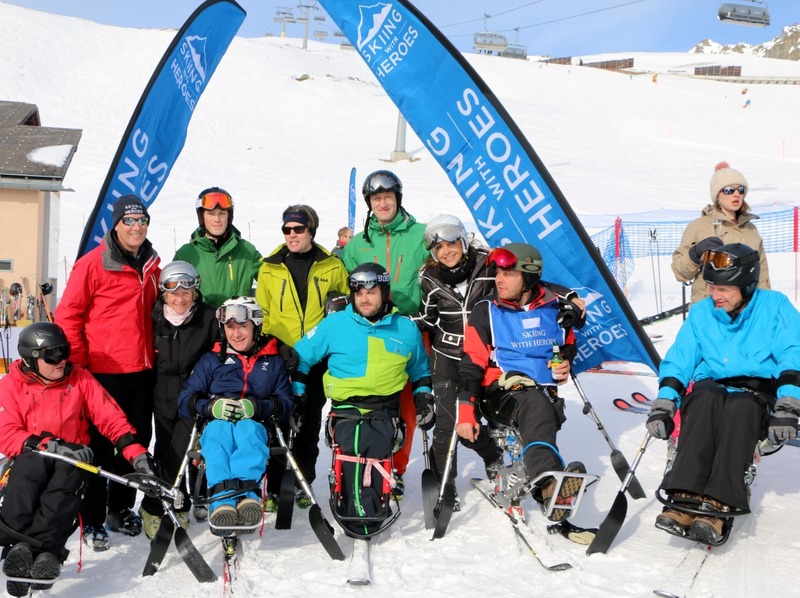 The serious business began on Thursday with the "Skiing with Heroes Marathon", an event which sees the teams ski together and try to accumulate as many km in the time permitted without being able to score the same run twice. Extreme measures are sometimes adopted to scupper opponents strategies, none more so than this year when one of the AIG team contrived to dislocate his shoulder resulting in his rescue helicopter causing the Schieferbahn to stop for half an hour; all those teams riding up at the time had their chances blown in one fell swoop! (for those anxious about Jack's welfare you will be pleased to hear he was out of hospital later that day although no skiing for him for a couple of months). Congratulations to Team Levmet who accumulated a very commendable 65km as they improved on their 2nd place last year to top the podium. Dinner that evening was at the Silvretta Parkhotel where several of the veterans recounted their experiences to the assembled and highlighted how Supporting Wounded Veterans had helped to turn their lives around. For those who don't know about the charity, the aim is to get wounded ex service men and women back into meaning occupation using its mentoring and jobs programme. The process starts off with the ski week which does wonders both for their physical and mental rehabilitaton and also includes access to their pain management clinic - pain management is one of the biggest hurdles these guys face when it comes to employment. The next day was the Giant Slalom which saw Business Challengers and veterans (some of whom have only done 1-2 weeks skiing ever) compete for the coveted accolade of fastest team on the hill. The lure of the snowbar at the bottom was an added incentive to get down quickly! Team "Angel and Demons" proved quickest. However the day was more about the afternoon as each team was paired with a veteran to ski with, an experience all the Challengers loved as it allowed them to experience first hand the real reason they were here in Klosters and the huge importance of the funds that they were raising. Most of the feedback we have had subsequently has commended us on the inclusion of this part of the programme. The weekend ended in high spirits with a prize giving gala dinner. Medals and Veuve Cliquot for the winners and a first for the event was the introduction of a veterans category given the international composition of the field. It is hoped that in future this will gain more prominence with talk already of veteran teams from the US and elsewhere in Europe entering the fray. This would be a wonderful goal to achieve. PT Ski is tremendously proud to be involved with the charity and to have organised this annual fundraiser which saw over 100 competitors take part, no small organisational feat. We were thrilled with all the positive feedback and even more so with the knowledge that the event raised ove £100,000 for this fantastic charity.